When it comes to finding a good barbershop in River North, you have a lot of options to choose from. But if you want the best barbershop in River North,come to State St. Barbers. Our clients know that when they come to us, they’ll leave looking and feeling their best—confident, well-groomed, and stylish. Our professional barbers and stylists pay close attention to each guest, which ensures a customized haircut experience. We’re glad to offer a range of services at or barbershop to suit men of all ages. Our barbers work hard to ensure that you look your best when you leave, no matter what type of style you’re after. Gentleman in Training Haircut: For our younger guests, this service is where it’s at. Offered for young men ages 12 and under, this haircut proves it’s never too soon to start looking your best. Gentleman in Waiting Haircut: For the gentleman on a budget in school, this haircut fits the bill. Enjoy our signature cut service at a discounted rate. Signature Haircut: Perfect for whatever style you’re after. This cut features a hot face towel, a straight razor neck shave, and a mini neck and shoulder massage—you’ll feel like royalty. Grey-Blending Services: Even though greying hair can look very stylish, we understand that it’s not everyone’s taste. If you want yours gone, our grey-blending services are what you need. This service subtly blends the grey away for a natural, youthful look. Beard Shaping: Put your best face forward in River North with our beard shaping services. Hot Lather Shave: Dollops of warm lather and a hot towel make this a truly luxurious service. 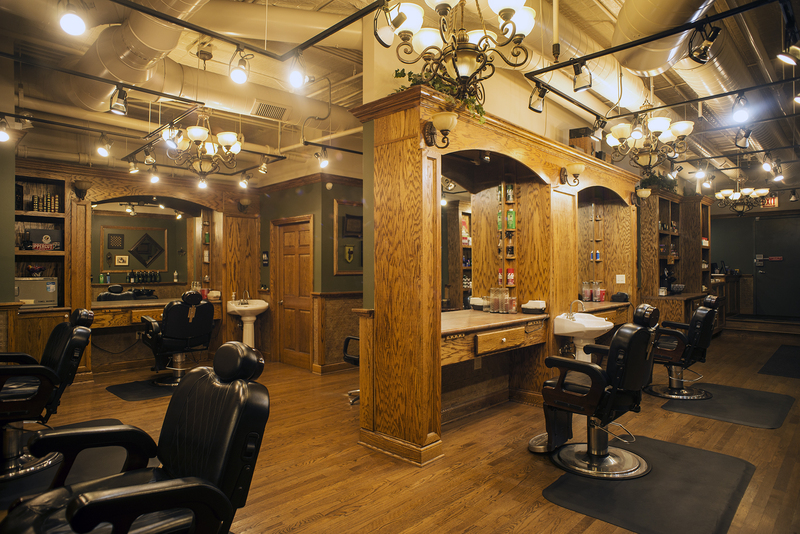 In addition to receiving services that are a cut above the rest when you come to our barber shop in River North, you can also expect to receive services that use top-of-the-line product. At our barbershops, we use and sell products like Men’s Dept. styling products, Layrite Original Pomade and Combs, Proraso shave products, Duke Cannon Man Soap, and Beard Balm. Located at 600 N Kingsbury, this location is nestled in the heart of River North. We’re open seven days a week, and although we recommend making an appointment in advance for the best possible service, we do accept walk-in guests.